On April 8 afternoon, K. Devdass, an independent candidate contesting in the 2019 Lok Sabha election from Chennai South was campaigning at Mylapore. He is a resident of R.A.Puram and runs a travel agency here. 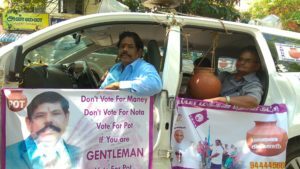 He was campaigning in a car along with his friend. A number of earthen pots (his symbol) were hung around the car. Devdass interacted and shook hands with a few people whenever the car stopped. And As the car took off, old songs with modified lyrics were played through a speaker that was fitted on top of this car. Many people seem to know him by the way he paid the nomination fee, “I know him, he is the one who used only one rupee coins to pay the nomination fee of Rs.25000. That’s how many of my friends and neighbors also know him,” says Gopal, a resident of R.A.Puram. “Even if I don’t win, I will continue to do social service to people,” he says. Devdass says he has recently helped a few underprivileged children, by paying fees for their studies. This entry was posted on Monday, April 8th, 2019 and is filed under Elections 2019. You can follow any responses to this entry through the RSS 2.0 feed. You can skip to the end and leave a response. Pinging is currently not allowed.